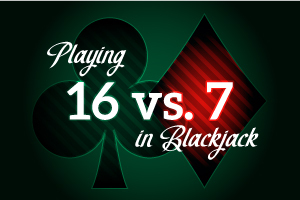 You're playing in a multiple deck game and receive a six and a ten for a two card total of 16, which you play against the dealer's upcard of seven. A 16 is not a great hand to have, obviously, and you're damned if you do and damned if you don't. So your dilemma here is whether to hit or stand on this hand. - one which is probably misplayed by a lot of people. There is a tendency to be scared to hit a 16, and that's easy to understand since in all likelihood you're going to bust. But in reality, the best way to help yourself here is to hit the hand. If you notice, the dealer has to play by strict rules in the casino which require him to hit on 16. And he winds up making hands to beat you, to the point where there is a house advantage to blackjack. We're using the same principle here. By hitting hands we can "make" hands, and there's no way we can preserve our bankroll in this case while employing a "no bust" strategy. If you stand in this situation, you are going to win 26% of the time and lose 74%. If you hit, you'll win only 27% (still an improvement), and will lose less, to the tune of 67.5% (the rest are pushes). So by hitting the hand, you are, for the most part, making an attempt to SAVE some of your bankroll.